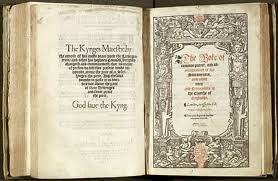 2012 marks the 350th anniversary of the 1662 Book of Common Prayer, known usually by its date or the initials BCP. The Archbishop of Canterbury’s Christmas sermon, criticised by people who obviously hadn’t read it as ‘political’, concentrated mostly on this anniversary and the treasures of the BCP. Today the second section of The Times had a two page spread detailing the way in which phrases from the BCP had entered our language, as song titles, book titles and catch phrases. Such things as ‘peace in our time’ from Mattins and Evensong (and the phrase used by Chamberlain on his return from Munich); and ‘ashes to ashes’ from the Service of Burial of the Dead, a title used by both David Bowie for his hit single in 1980, and the more recent TV series starring Philip Glenister. You won’t be able to read the original unless you subscribe to the Times online or buy a paper copy; but can you identify where these phrases come from; and how they have been reused in recent times? This entry was posted in Books, Church, Liturgy, Media and tagged 1662, BCP, language, literature, pop groups, titles. Bookmark the permalink.